This week I found myself reading two chunksters at the same time. Maybe I should explain the word found. In order to keep track of my library books, I keep a spreadsheet which tells me how many renewals I have left for each book, along with what date the books are due back (yes, I know I am a nerd. I have several other spreadsheets that I could tell you about too, but I won't!) It just so happened that the two books I was reading were due back within two days of each other and so I ended up reading them both at the same time. I love reading chunksters. There's just something about a really big book that I just love, and this started when I was really very young. 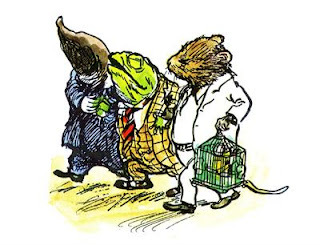 I remember being very proud of myself when I was 6 or 7 and I had read The Wind in the Willows all by myself. In my memory the book was very thick, but I realise now that it probably had very big writing, or a lot of pictures because when I looked at a copy a while ago it really wasn't all that long but to my child's eye it was a massive tome! Fast forward to my late teens, once I started working I would go to the bookshop at least once a week (usually more often) and I would often choose books to buy based on how big they were. Authors such as Nelson DeMille, James Michener, John Jakes and Noel Barber (all of whom I am intending to read again some day were on my list to buy). Move forward another 15 years and more chunkster authors like Diana Gabaldon and Paullina Simons have joined the list. Looking at my pile of books to be read and there are quite a few big thick books that are waiting to be picked up, although I don't think that I pick up books that often any more just because they are huge. I am more likely to pick a book because I have heard good things about it, and it just happens to be a chunkster, or because they are authors who I have read previously. Even without going out of my way to find chunksters, enough still find me to be able to having completed the Chunkster Challenge for the last few years, and these two books give me a good start for this year's challenge. I know that not everyone loves big books, but I do! How about you? Do you like chunksters or do you avoid them? Does a chunkster strike fear in your heart or excitement? If you would like to see which books I was reading this week then check out my Teaser Tuesday post. Im ok with chunksters but I am not a massive fan to be honest. I think I have a problem with patience maybe. Good luck with your chunksters challenge! I am a big fan of chunksters but I am not sure whether I could manage two at once. I like to be totally absorbed when I am reading a big book so sharing my brain with two stories is not something I can do. Oh, you know I love chunksters. You still have to try some of Susan Howatch's. I'll admit it--chunksters usually strike fear in my heart! I am trying to remedy that though. Currently I am reading East of Eden, which is definitely a chunkster! I did the exact same thing when I was younger -- that's how I read Little Women, The Grapes of Wrath, and a ton of Michael Crichton books in middle school. I do still love a good chunkster, especially when they don't feel long. I'm in the middle when it comes to chunksters. Sometimes I'm in the mood for a big book and other times not. I'm just beginning Wolf Hall which is a chunkster! LOL - I didn't really realize just how much chunksters intimidated me until I picked up The Sunne in Splendour. I like the feeling of accomplishment like I am reading 3 books in one, but sometimes I lose patience and need to put them down at section break and begin something new. I'm starting The Scarlet Lion by Elizabeth Chadwick tonight and am really looking forward to it (not that that's a chunkster, but just thought I'd let you know because I know you're such a fan!). I'm glad EC's books are finally slowly but surely being published in the US by Sourcebooks. Hopefully we won't have to wait extra long for To Defy A King. I plan to try and read the rest in that series before its pub date. samantha.1020 - Wolf Hall was excellent and besides being a chunkster it was also incredibly dense, which made it feel even longer! Like you, I love those chunkster books, and often I will pick a book based on the size. I like the fact that there is so much there to get invested in and much prefer them to any other types of read. Long live the chunkster! I love chunksters - always have. I remember as a kid I would browse the library stacks to look for the fattest books. I found some gems. Just like you, as a teen I browsed for the thick books.I think blogging has actually come to interfere a bit with my reading of the longer books, because I feel like I go so long without a review to post. I've made a conscious effort this year to read more of the longer books than I have in the past few years. I've already read East of Eden and have several more in my plans. I love big books, too! Though SUPER big ones really intimidate me. I have no trouble picking up something around 500-600 pages long, but once it gets past the 600 page mark, I start having qualms. Especially with non-fiction, but often with fiction, too. I like to buy huge books, but it takes me a long time to actually read them. Aarti, I love to buy them too. To have those large books sitting on the shelves looks so good! SuziQOregon, it's not so much the not having reviews that stops me from reading lots of chunksters now, but more that there are so many good books out there, that it seems a little wrong to spend time on just one book for an extended period of time! Zibilee, there is nothing better than getting lost in a really well written book - so you can get lost amongst an epic story! Fantastic. Bernadette, it isn't only Wolf Hall's size that is intimidating, but also what I have heard about the density of the language. Wolf Hall is one of the chunksters I have sitting on my shelf staring at me. Allie, yay for starting Elizabeth Chadwick! I normally try not to read two books with a similar setting or even genre. Looking forward to hearing what you think of Wolf Hall Samantha! Stephanie, East of Eden is definitely a chunkster! Aths, a book of over 1000 pages almost needs a bigger category than a chunkster! Misfit and Eva, it is no surprise to me that you both love chunksters! Livemorenow, I am fine with reading two chunksters at one time, as long as they are in no way similar to each other. If they had similar time frames or settings I couldn't read both at the same time! Thanks for the good luck wishes, Becky. I wish I was as organized as you with spreadsheets. As it is, my way of organizing things is to put them in an ever growing pile at the side of my desk. I don't think I've ever really thought about the size of a book before - as long as it looks/sounds like something I'd like to read I dig in. TSS: Do you like your fiction political? How to make a good concert a GREAT concert!